Like most I find January to be a drag - the festivities of December are over, it is still cold, dull and all you know winter to be and again like the majority I am broke. Same story, different year but I do have some cheer inducing products to see you through the rest of the winter hopefully with a smile on your face. My first tip or recommendation if you will is to find a bright and cheery scent for your home be it a reed diffuser, a candle or wax tart it is amazing how a fruity fragrance can uplift my mood in mere seconds. My current favourite has to be Orla Kiely Basil and Mint candle (find it via John Lewis in its full sized glory - link) but as it is £24 I will have to wait until pay day to replace my miniature. For a cheap but oh so cheerful treat I recommend Yankee Peach Mango Salsa (find it here for 88p - link) wax tart for just over £1 you can fill your home with a scrumptious fruity scent that will make you forget all about the rain outside. Continuing with fragrances I recommend purchasing or raiding your stash for a fruity shower gel, I am currently hooked on Neom's Refresh Body wash which is a blend of Sicilian Lemon and Fresh Basil. It is so fresh and zingy and just what I need to get me going on a cold dreary morning. At £18 it is not cheap so a great alternative is Original Source's Tea Tree and Lemon Shower gel which is an utter snip at just 99p! You can find it here via Superdrug - link. When I'm a little down in the dumps I do tend to douse myself in a Victoria's Secret Body Mist - so wrong but so right. Yes these body mists gear a little towards the synthetic side but boy do they cheer me up, not to mention for a body spray they are so long lasting. I have a good few (I tend to stock up when I'm in the states) but my favourite has to be Forbidden Fantasy. A blend of Passionfruit and Jasmine that reminds me of times spent on the beach. 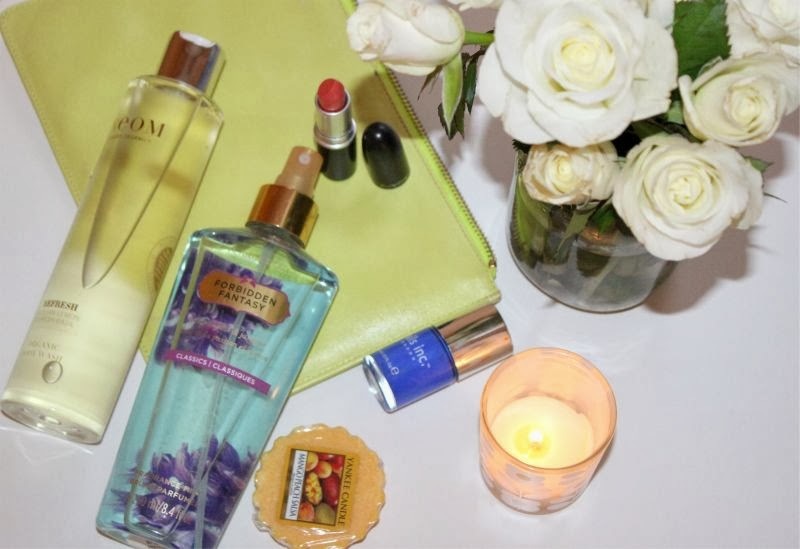 Annoyingly Victoria Secret stores are few and far between in the UK but you can find a selection of body mists and body products here - link. Don't undermine the power of a bright lipstick to shift your mood, many swear by a bright red lip to make them feel ever powerful once again. For me it is more likely to be a bright pink (MAC Candy Yum Yum for the win) or a beautiful coral like MAC Ravishing which is in the above photo. Not a fan of lipstick or want a little more brightness in your life? Well time to paint those nails a sunny hue or two, my fail safe instant happiness in a nail polish bottle has to be Nails Inc Baker Street (find it here - link) - bright yet classy. The only downside is that it chips like nothing else I own. I like any excuse to pamper myself so when I'm feeling the brunt of January I do like to pop on a face mask and a good comedy dvd to chase the winter blues away. My film choices leave a lot to be desired but if you are feeling the pinch may I recommend the Quick Fix mask range. Five tubes of face masks each designed to target a specific skin concerns and the best part is that each only costs £5. Find them here - link. If all else fails I find a bunch of fresh flowers never fails to put a smile on my face. It's the little things isn't it? That and dreaming of the summer also helps.